Allison "Alley" Mills (born May 9, 1951), also known as Alley Bean, is an American actress best known for her role as Norma Arnold, the mother in the coming-of-age series The Wonder Years, and her current role as Pamela Douglas, the sister of the late Forrester matriarch Stephanie Forrester (Susan Flannery), on the soap opera The Bold and the Beautiful. Mills was born in Chicago, Illinois. Her father, Ted Mills, a television executive, died in August 2003. Her stepmother, Genevieve, whose real name was Ginette Marguerite Auger, died in March 2004. Alley's mother, Joan (Paterson) Mills Kerr, an author as well as an editor for American Heritage Magazine, died in November 1996. Her stepfather was Chester Kerr, former director of Yale University Press. She has one sister, Hilary Mills Loomis, and one brother, Tony Mills. Her first acting role on television was in the short-lived comedy, The Associates, where she played an attorney, opposite a then-unknown Martin Short. She lives in Los Angeles with her husband, film, television, stage actor, and author Orson Bean. Bean is well known for being a long-term celebrity panelist of To Tell the Truth and Match Game. Mills (who is twenty-three years his junior) is Bean's third wife, and they have been married since 1993. She also appeared on a special "Celebrity TV Moms" episode of the Anne Robinson version of The Weakest Link, in which she was the second one eliminated. Mills had a recurring role in the television series Dr. Quinn, Medicine Woman, as Marjorie Quinn, Dr. Michaela Quinn's sister. She had previously appeared in the series as a saloon girl. Mills joined the cast of The Bold and the Beautiful as Pamela Douglas, the estranged sister of Stephanie Douglas Forrester, on December 1, 2006. She was put under contract, but after making only a handful of appearances, her character went insane, was confined to a mental hospital, and then disappeared from the show in March 2007. Mills reprised the role on recurring status in 2007 and 2008 and has been added to the opening credits as a contract player as of December 2008. 1978 The Waltons Nancy Episode: "The Obsession"
1979 Kaz Episode: "They've Taken Our Daughter"
1981 Lou Grant Lisa Episode: "Search"
1983 Newhart Professor Episode: "Sprained Dreams"
1986 Moonlighting Claire Episode: "The Man Who Cried Wife"
1987 Mr. President Pat Episode: "Pilot"
1987 I Married Dora Janine Desmond Episodes: "Where There's a Will, There's No Way", "West Coast Story"
1987 Punky Brewster Donna Deaton Episodes: "Open Door, Broken Heart: Parts 1 & 2"
1990 ABC Afterschool Special Linda Episode: "Testing Dirty"
1994 CBS Schoolbreak Special Carol Oliver Episode: "Love in the Dark Ages"
1998 Touched by an Angel Liz Episode: "Last Dance"
1999 Profiler Amber Wiley Episode: "Inheritance"
1999–2000 Popular Robin John Episodes: "Wild, Wild Mess", "Ch-Ch-Changes", "The Consequences of Falling"
2000 NYPD Blue Sonya Morrow Episode: "This Old Spouse"
2002 Girlfriends Lynn's Mother Episode: "Don't Leave Me a Loan"
2002–2003 Sabrina the Teenage Witch Diana Spellman Episodes: "The Whole Ball of Wax", "Soul Mates"
2003 Strong Medicine Rhonda LaCouer Episode: "Prescriptions"
^ Monika Guttman. "Wonder casting: hippie to housewife". St. Petersburg Times. June 25, 1989. TV DIAL, 6. 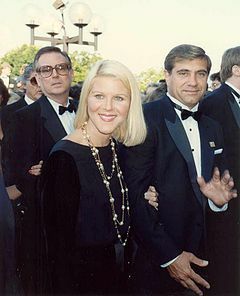 Wikimedia Commons has media related to Alley Mills. This page was last edited on 11 April 2019, at 04:23 (UTC).